lifestuff.org | Life Skills for Work & Play. Wheelchair door width minimum – Try this! Wheelchair door width minimum. How wide is a standard wheelchair? Total width of wheelchair. Wheelchair dimensions. 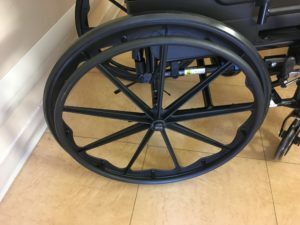 If you are looking for this information, locating exact wheelchair measurements is like searching for clues to a crime. Here’s what we did when we needed a 20″ wheelchair to work in a house with 29″ doorways (and if those doorways have a door hung, it’s closer to 27″, give or take). 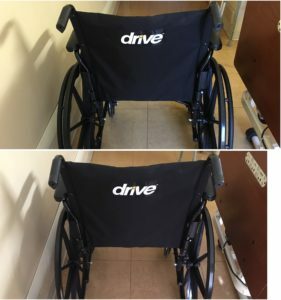 We removed the handrims to make the wheelchair fit through our narrow doorway. They come right off! It is too small to accommodate my mom for such a long period of time. She’s going to be living in this chair for a while. Even more important, is the fact that if you are injured and your wheelchair is part of your recovery through insurance, a prescription is written for your wheelchair and the prescriber’s job is to write the prescription for the best equipment for your recovery. After doing my own research and deciding that an 18″ wheelchair would be the smallest chair that would be comfortable and fit through the doorways, I called the rehab facility and begged them to provide an 18″ wheelchair. They couldn’t, because the prescription was written for a 20″ wheelchair. The specifications on 20″ models were 28″ or 29″ total width. The house is a small 1940’s bungalow with 26″, 27″ and 29″ doorways between rooms. My poor mom was going to have to stay in the living room for the foreseeable future. It’s a nice living room, but all her other rooms would literally be an inch out of reach. Next, I thought, “the heck with this prescribed wheelchair!” We’ll just buy an 18″ wheelchair and be done with it. I can return or donate the one they prescribed and everyone will be satisfied. And then, the little voice of Linda the PT chimed in with the fact that you can remove the handrims. On the backside of the wheels you will see screws. 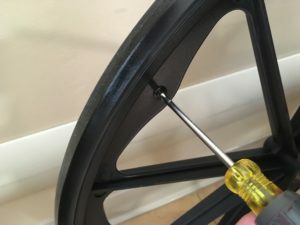 These screws hold the handrims on the wheel. 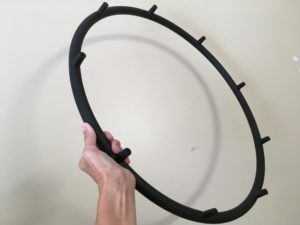 The spacers between the handrim and the wheel are part of the handrim, and that is where the screws attach and hold the rim in place. They come right off in ten minutes or less. Work your way around each wheel, removing the screws. You will notice the handrim getting loose. Remove both rims and, viola! You have a wheelchair that’s total width is about 25″. Your wheelchair user can easily propel themselves using the wheels. Not the greatest photo. You can’t really tell how big of a difference in width there is, but the above photo is with handrims, below is without. Today, my mother is happily tooling around the house, bumping into walls and backing into appliances… because her wheelchair fits through the doorway between the living room and the kitchen. She sleeps in her bed, and eats at the dining table – all because Linda muttered a few words during a therapy session. Thank you, Linda! Thank you for reading this article! Please leave a comment – sharing is caring. Life Skills for Work & Play. Are dryer sheets dangerous? Is Fabric Softener toxic? What am I doing with my Life ? Thanks For Visiting Theme by BrightCherry.